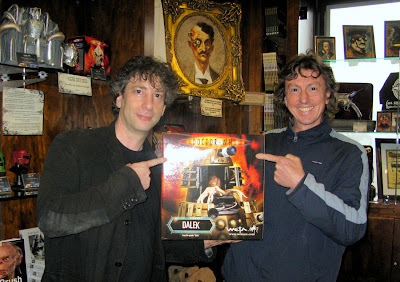 Neil Gaiman, who rewrote the book on creator-owned comics, with Sandman and Death: The High Cost of Living, is right here in New Zealand, visiting Peter Jackson's Wellington based WETA Workshop! A huge Doctor Who fan, Neil (on right – WETA’s David Tremont on left) took a few moments to visit the WETA Cave - a tourist spot where you can see the props, models, toys and effects WETA have created throughout their amazing history. It wasn't all sightseeing for the legendary scribe though, Neil tweeted that he lunched with Sandman fan, director Guillermo Del Toro, saying; "Guillermo was in fine form. Many movies were discussed over lunch including Death and The Hobbit." A movie about Death - the upbeat, bubbly and positive girl who is the guide to life's start and it's end - would make for an awesome film, and a sure-fire sleeper hit. 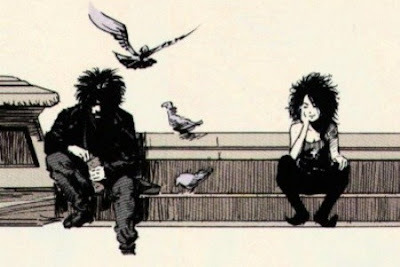 The character was a core part of the Sandman cast, and Empire Magazine named her the 15th greatest comic book character of all time. With Del Toro in the directors seat, millions would get to find out why.